Acoustical Surfaces Inc. has been solving soundproofing, noise control, acoustical and vibration problems for over 25 years. 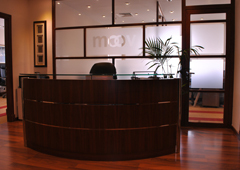 The MOOV interior offers space management for any interior, promotional or branding challenge. MOOV special ventilation solutions to the most sensitive sectors, such as labs and nuclear industries industry. MOOV show you a new dimension for entertainment as it is an industry leader in creating dedicated home cinemas. All of the MOOV Business units are professionally organised and managed and have been established to focus on customer service delivery and provision of high quality products and services. The group has emerged as one of the most successful and professionally managed enterprises in UAE. Our activities are based on mutual trust and flexible cooperation with our customers at every stage of the work. With the high quality and reliability of our services, we have always been able to fulfill our customers' requirements and establish long-term relationships with our clients from all over the world. The Moov Group is participating in the BIG 5 Exhibition 2018 to showcase on its applications in the Acoustics and Sound Proofing Industry. UAE Soundproofing Company - Moov Group says services are in demand. We look forward to welcoming you on May 8 and 9, 2014 at our next international competence seminar – once again with highly topical subjects and renowned speakers.